Seriously, Bourjois have knocked it out of the park this summer with what has been my favourite collection in aaaaaaaages! From the nail polishes to the bronzing primer, lipsticks to my now favourite mascara of the year, and don't even get me started on the blushes, I've been spoiled for choice and looking fabulous. I was given two of the four new Color Boost lip crayons to play with, Peach on the Beach and Fuchsia Libra and even though I'm on a self imposed spending ban, I'll be picking up a third one, Orange Punch and pretending I'm not buying Red Sunrise, when I think we all know I will be. Housed in a twisty uppy tube, these lip crayons are one of my favourite products to whip out when I'm walking into a coffee shop to meet someone, forgetting that I don't have a bit of somethin' somethin' on my lips and not needing a mirror to lash it on. Formula wise, it feels really light on the lips and isn't sticky or drying. 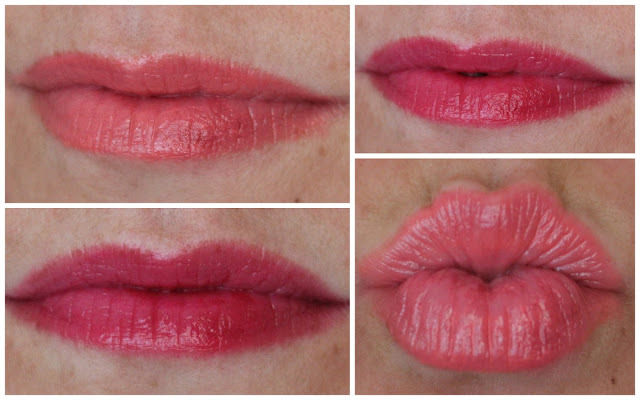 They're delightfully pigmented and fade away leaving a light stain on the lips. They leave a slight glossy finish on the lips and it feels like you're wearing nothing on your kisser at all at all. Oh and they have SPF15 which makes me happy. More lip products should have SPF. They claim to have a waterproof formula so I'm sensing I need to do another one of my experiments, what do you think? Fuchsia Libra is a gorgeous raspberry shade that adds a pop of colour to the lips and is one I love wearing when I'm not wearing much else. On my face that is. Peach on the Beach is a creamy peachy shade that just makes me happy every time I wear it. It's my go to shade for the summer and I feel very tropical altogether when it's on. As I said, the orange shade shall me mine, mine I tell you when they launch this month. The rules of spending bans are null and void when you love something like these, so shhh. Spending ban will be back on soon. €10.49 is the damage and I'll happily fork that out for my orange shade, so stay tuned for my review of that. These are by far one of the best, if not the best, lip crayons out there on the market. Love 'em. Check out my recent posts on all things Bourjois and prepare to want to spend all your money! Peach on the beach is gorge! Ooooh pretty. Can't believe they have an SPF15 too, thats the deal breaker for me! I know, it'd be a sin not to get one or two (or four)!